So, you’re travelling around the holidays? Well, the first thing you will need to prepare for are some seriously long lines. Yes, every airline and every security line will have a massive line-up. (Every. Single. One!) It is just a reality of travelling during this time. So, instead of getting annoyed or angry, prepare yourself for it beforehand. That way, you won’t end up feeling frustrated by the time spent waiting around. With those long wait times comes an awful lot of stress – especially if you haven’t allowed yourself enough time to get through baggage check and security. In order to be prepared for the holiday rush, you will definitely need to get to the airport early. Not just a half hour earlier, either. Your best bet is to show up an hour to an hour and a half earlier than you normally would. You may find that this step wasn’t necessary, but often times it is…particularly the closer you get to Christmas. By being there early you guarantee your spot on the plane and also give yourself enough time to get through all of those treacherous lines. Travelling during the holiday season isn’t just tough because of the crowds. It can also bring along with it bad weather. 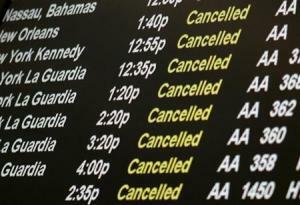 As a result, more and more flights are cancelled or delayed at this time of year. As frustrating as this can be, it is better to expect it. Always check the status of your flight before you leave home…and do your best not to get too upset if you do experience a delay or cancellation. Keep a cool head and try to have a backup plan ready, just in case. There are also all kinds of different holidays. Some are already prepared for you like China package tours or all inclusive Mexico resorts. When you book your trip and have everything planned beforehand, it makes your work and wait times less than if you had to book and figure it out along the way. It is always a good idea to be friendly and polite. It doesn’t matter if you’re talking to an airport employee, flight attendant, or fellow travellers. Tempers tend to run high during this time of year. You don’t want to start an argument or cause a problem. That will only make the situation worse. Even if someone else is being rude, do your best to remove yourself from the situation. It won’t help you get to your destination any faster! So, take a deep breath and do your best to be courteous to everyone around you. It will make your overall experience that much better. There is no question that travelling during the holidays can be stressful. If you’re prepared for it though, you can spend less time stressing and start focusing on getting to your destination.